Multipurpose seating for community, office , residential and hotel environment. Rudy is made of a single beech shell (10mm thick) with simple and informal edge, and becomes extremely versatile thanks to the several upholsteries and frames available that allow a different configuration of the range without changing its original purpose, depending of its final use. The shell is proposed in the version upholstered with or without horizontal stitching or with edge in plain view otherwise the wooden version available in natural beech or moka finish. The seat can be equipped with a 4 races swivel chromed tube base (diam. 22mm) on castors (also with feet av.) or 5 races Loop base. Simple and handy can be easily placed in all environments with success. The top for versatility and completeness is obtained with the available fixed frames. Elegant and efficient always use all different types of frames: 4 chromed legs (diam. 18mm) without or with integrated armrest, rod chromed cantilever frame (diam. 12mm) and stool rod chromed frame. 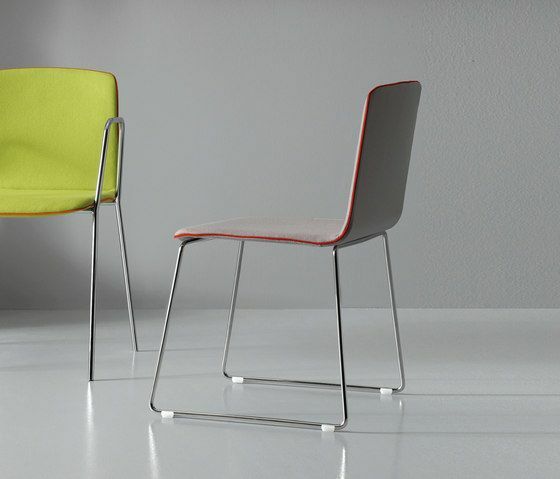 Both versions, 4 legs or cantilever are stackable in order to simplify its usage and movement during meeting or contract purpose.